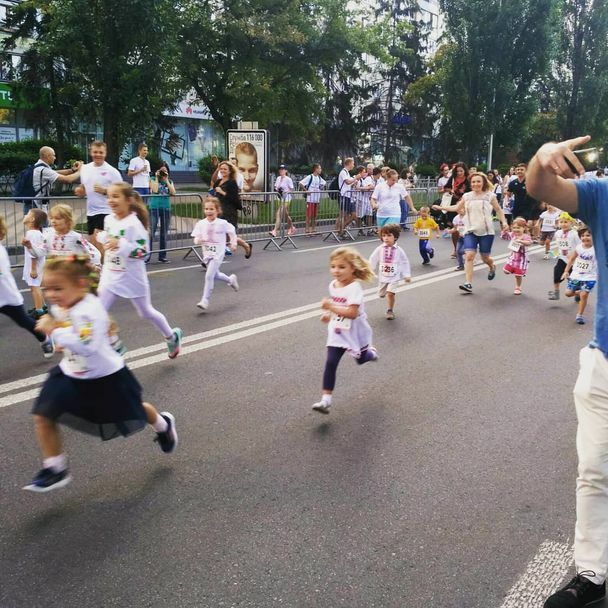 Vyshyvanka Run took place in Kyiv on the Day of Independence of Ukraine, on August 24. The run became the major sports event of the day. According to the organizers, over 800 people participated. Not only adults ran the race, but children as well – the distance ranged from 100 ms to 10 km. Every participant was wearing a vyshyvankas – a traditional Ukrainian shirt with traditional embroidery, a trend which became extremely popular in Ukraine during the last decade. 1 km run was charitable - the collected funds shall be spent on the sportswear for the students of Complex Youth Athletic Center #1 of Bakhmut City Council (Donetsk region, Ukraine-controlled area, - 112 International). The run marked it’s first mini-jubilee – the fifth anniversary. The team of 112.international also participated in 5 km run – none of the three female editors withdrew the distance and finished up in the first hundred. The event was aimed at spreading patriotic stance among the Ukrainians, involving people in regular physical exercises and sports, developing mass sports in Kyiv and in Ukraine in general, creating a positive image of our country in the world.